This Excalibur 3926TCDB food dehydrator is a useful addition to a kitchen. Its beautiful design in white lends it elegance and function. With this food dryer machine, you can easily dehydrate your favorite fruit or vegetable and get all the benefits associated with food dehydration. Includes Polycarbonate Clear Door - Latest Model! The Excalibur dehydrator 9 tray is a modern way to food dehydration, which brings a lot of value to your food. 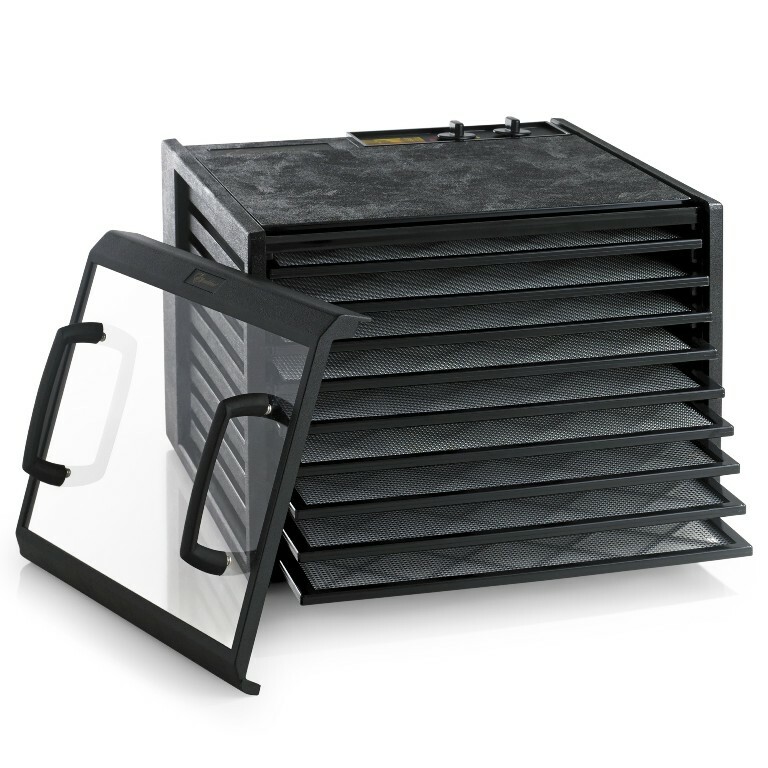 This dehydrating machine is simple to use, and what makes this tray so much useful and unique is: it uses Turbo Charged Parallexx Drying System, which completely eliminates any kind of contamination, which was common in the past, during the long process of dehydration. It offers you advanced dehydration solutions by offering everything you require to achieve perfection, and hence, making your dehydration process all the more easy and smooth. The Excalibur 3926TCDB has a tough and durable polycarbonate construction, which makes it almost unbreakable and washable with dishwasher. Includes adjustable Thermostat, a heavy-duty fan and all the electronic controls provided at the bottom of the dehydrator, ensures its 26 hours of uninterrupted operations. You can set the timer for twenty-six hours and the process will terminate automatically as per the time you�ve selected. It is easy to maintain and food can be preserved safely for many hours. No need to rotate the tray as the drying can be done instantly. Horizontal airflow facilitates maximum dehydrating efficiency. This dehydrator is amazing! I absolutely love it. I've made jerky, fruit leather, dried bananas and plantains and can't wait to make more. If you're looking for a way to have healthy snacks on hand, especially for on the go (and you control the ingredients), this is the way to go. Highly recommended! Beat the lowest price, as advertised, fast shipping, great product. Couldn't be happier! Although I\'ve only used this dehydrator to dry apples and make beef jerky so far, I\'m very happy with it. It works like a charm and seems to be well made. I've already recommended this dehydrator and Harvest Essentials to friends who are interested in getting into dehydrating. I've never dehydrated food before. A friend recommended this brand. The books it comes with are very useful. It dries so evenly! I don't have to turn trays around or anything. I bought the extra mats for fruit leather and they worked fabulous! It makes me want to dry everything!! Works like a charm...love it! I went from the round dehydrator to the Excalibur and I have to say it is far superior. I've used it about 4 times so far and it works great. Even drying and a lot faster. Haven't tried beef jerky in it yet, which is next. The only thing I don't like is when I dry herbs they blow all over the dehydrator and don't stay put. I now put them on the very bottom rack, which seems to help. Highly recommend. The glass door is worth the extra cost. I can see the food without removing the front door. I got this after seeing how great my boyfriend's was. It works really well and you can fit a ton in there. I like the slide out tray design, as opposed to the stacking design a lot of other dehydrators have. It's easy to store since it's not round too! everything arrive in perfect condition and the equipment is working beautifully! Outstanding dehydrator with loads of practical features. I've used this several times since purchasing for making jerky and sweet potato treats for our springer spaniels. The booklets that came along with this product are so useful in guiding you along the path of dehydrating all sorts of products (vegetables, fruits, jerky, etc.). A novice like me was made a seasoned professional in no time thanks to the outstanding product and booklets. I have been thoroughly satisfied with my dehydrator, that is after the first one got sent back (the reason why I rated a good and not excellent). Our first machine broke after being on for 5 minutes, with an entire batch of carefully prepared fruit in it. Oh well. However, hats off to Harvest Essentials because they let us return it with no charge and sent us another one with the recipe book included! Yay! I have dehydrated beef jerky, a plethora of vegetables for making vegetable soup stock powder, and have made fruit leather and crackers! I predominantly use it for live foods, so dehydration no higher than 105 degrees. It takes a bit longer for most things (and some veggies take a whole lot longer), but they have all turned out well. I haven't added an internal temperature reading, so I'm not 100% positive what the actual temperature is. The knobs for the temp and timer aren't extremely accurate, but everything seems to be a guestimate with dehydrators anyways. I do like the large size because I am able to do a lot of dehydrating at once. However, there have been a couple times where I've been scrounging for filling up extra space, so be ware. This dehydrator holds a lot. The size does come into play a bit with counter space and with cleaning. It really isn't too bad to clean (most stuff comes off easily), but my sink isn't wide enough to really submerge the black trays in water. However, they don't normally get too dirty, especially if using the paraflex sheets or parchment paper. As far as counter space, I actually leave it in the garage or back room once it's going, especially since whatever is being dehydrated is very aromatic for the first couple hours, depending on what it is of course. It's seemed to work out just fine. We have had this dehydrator since just before Christmas (2014), so I can't say anything about it's durability with time. However, since the replacement we haven't had any problems. Our organization loves this dehydrator! It helped us preserve tons of food for the winter months. The customer service was excellent as well.